UV Nail Polish Gel Base + Finish is a base and shine polish and gel, all in one. It must be used in very thin layers before applying a colourful polish and gel and upon strengthening the colourful polish and gel in order to make nails even more shiny. 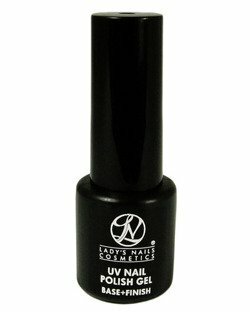 UV Nail Polish Gel Base + Finish is a base and shine polish and gel, all in one. It must be used in very thin layers before applying a colourful polish and gel and upon strengthening the colourful polish and gel in order to make nails even more shiny. Following its strengthening in a UV lamp, the last sticky layer of the UV Nail Polish Gel Base + Finish shall be removed with the use of a cleaner. UV Nail Polish Gel Base + Finish ensures that your polish and gel will adhere ideally to your nails, extending their durability and making them more charming.